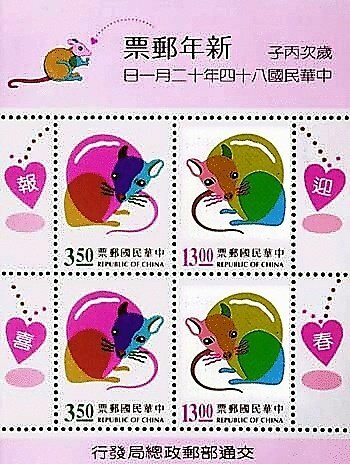 What do Chinese post as Chinese New Year Symbols? Posting Chinese New Year symbols is a major part of Chinese New Year customs.The following are four types of very popular Chinese New Year posters. "Fu" character posted on the door of a Chinese shop. 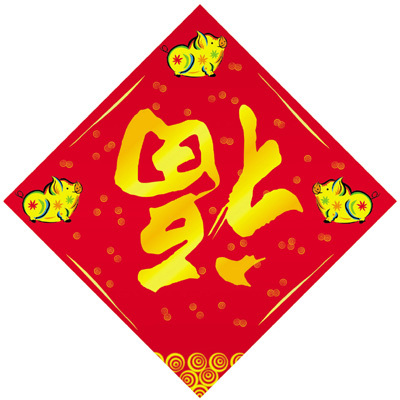 The Fu Character may be one of the most popular Chinese New Year symbols for modern Chinese people. The Chinese character Fu means fortune. It can be posted either in normal position or upside down like in the above picture. Why post it upside down? In Chinese language, the character "upside down" is pronounced exactly the same as the character "arrive". So this is a homophone rhetoric to mean "Fortune arrives". There are many different designs and types of craftworks of the zodiac animal,which can be color printing, papercut, coin etc. Different countries like China, Taiwan, Korea and Canada etc publish post stamps of the Zodiac animal of the year. 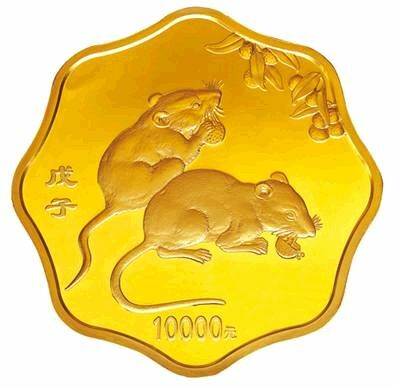 The following are some exmaples of Chinese New Year zodiac crafts of this year, the Rat Year. Most Chinese New Year paintings of blessings are drawings of objects which are homophone Chinese characters of some specific good wishes. Chinese character 鱼 (pinyin: yú for FISH has the same pronunciation as the character 余, which means surplus. 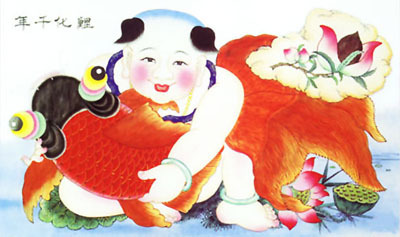 So fish paintings are very typical Chinese New Year symbols for wealth, through which the blessing is that the family have surplus money and grains left after all expenses. The Chinese character for BAT is homophone of the character for FORTUNE. Similarly, FAN is homophone of GOOD. See in the above picture, there is one bat near the two boys' feet and another bat above the second boy from right. And there are fans. The symbols of longevity are not adopted because of homophone but from fairy tales. 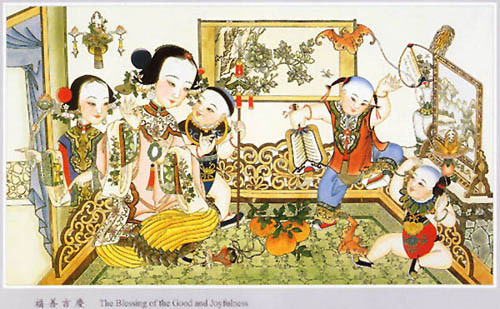 In Chinese culture, She-wong-moo, the Mother Queen of the West is the most respectful goddess in heaven. In the place where she lives, there are peach trees that only fruit every 3000 years. If any human being eats the peach, the person can live a long life and become a deity. So big peach becomes the typical gift food in birthday party or and the symbol of longevity. In Chinese culture the Deity from South Pole is the God in charge of human life length. He bears an image of an old happy gentleman with very big forehead and long white beard. He always takes a dragon-head stick, on which a calabash is hung. He often stands under a pine tree with a crane beside him. His image is also a popular Chinese New Year symbol. One of the most important good wishes in Chinese culture is to have many sons. 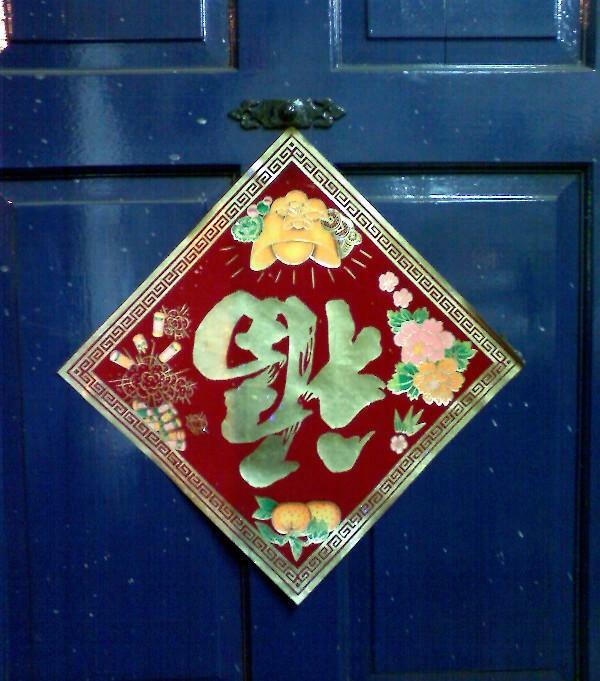 This is often expressed in Chinese New Year symbols using homophone rhetoric. In the above picture, Lotus flower is at the boy's right side. Lotus seeds are at his left. And he is playing a traditional Chinese musical instrument: Sheng. These objects are all homophone rhetoric. 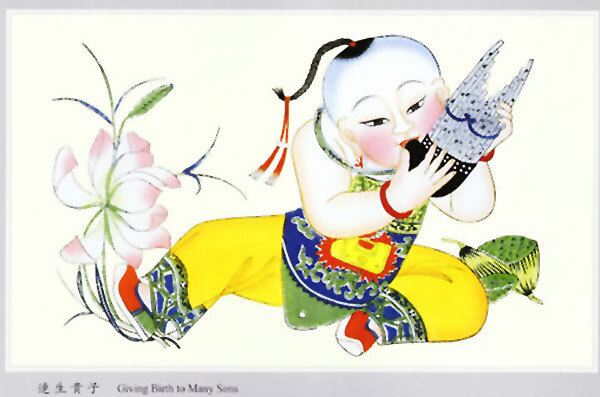 "Sheng" in Chinese language is the homophone of the character for "Give birth". The "lotus flower" is the homophone of "continually". "Lotus seeds" is homophone of "continuous sons". Therefore, the title of the picture is "Continually give birth to sons". 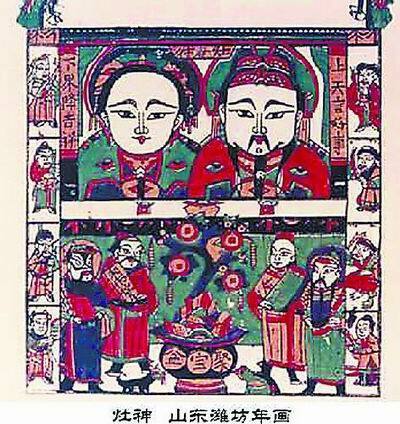 Traditional Chinese culture was a semi-divine culture. In early stage, it was a period that deities and humans lived together. In historical records, those deities were figures in human world, but they had divine power. This was quite similar to the ancient Greek culture. You know in ancient Greek culture, there were goddesses in charge of love, beauty, wisdom, war etc. In traditional Chinese Taoism culture, it is quite similar to that. There are special gods or goddesses in charge of various aspects of people's daily life. This even extends to trivial things like people's kitchen stoves. Pictures of these gods constitute an important part of Chinese New Year posters. The following are three of the most popular symbols. 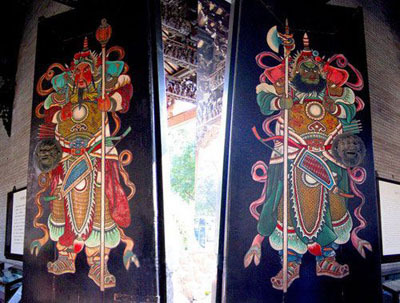 The Gods of Gate are actually two very major martial generals of the Tang Dynasty named Qin Qiong and Yu-chi Gong. Once Emperor Tang Tai-zong was ill and could not sleep at night because of disturbance from ghosts. The Emperor told the trouble to his cabinet. Two very brave martial generals took initiative to guard the palace at night while wearing their armors and taking their weapons. It really worked! The Emperor had a good sleep. Considering that it was too arduous for them to be on duty each night, the Emperor told painters to make paintings of their image and hang them on the gate of palace. Since then, the palace got peace. Because of their verified record of having divine power of driving away ghosts, later Chinese people started to post their images on gates to secure their houses. There are different versions of Deity of Kitchen Stove. 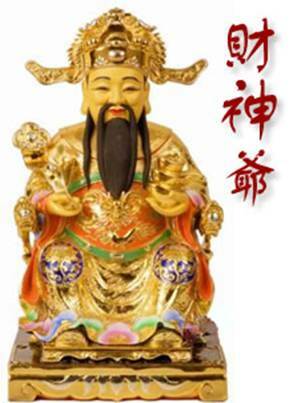 In some area, the Deity is a male named Zhu Rong, who was Yellow King's cabinet official in charge of fire. In some other areas, the Deity is a couple. The Gods of Kitchen Stove not only look after the cooking place of a family but also are responsible for recording the good and bad deeds of the family members over the last year. On the 23rd of December of Chinese Lunar Calendar, Gods of Kitchen Stove go up to heaven to report their records to the Great Emperor of Jade. So Chinese people have a custom to hold rite and sacrifice wine and barley sugar to the Gods of Kitchen Stove on this day. There are several historical figures being worshiped as God of Wealth. 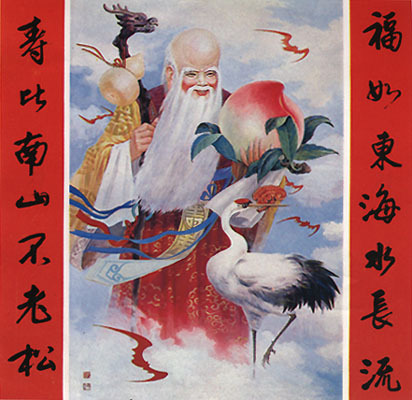 The main God of Wealth may be Zhao Gongming, who was a god in Taoism. The other God of Wealth is the famous military general Guan Yu in Three Kingdoms period, which was in about 200 A.D.
Have you seen any Chinese New Year symbol? 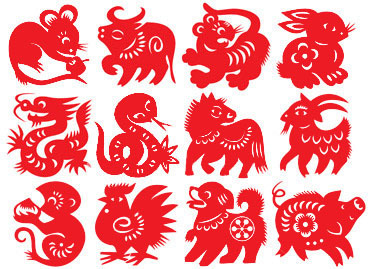 Do you want to share an interesting picture of a Chinese New Year symbol or do you have a question about a Chinese New Year symbol to ask? Please share it here with everyone now! Your sharing will appear on a Web page exactly the way you enter it here. You can wrap a word in square brackets to make it appear bold. For example [my story] would show as my story on the Web page containing your story. Return from "Chinese New Year Symbols" to "When is Chinese New Year"
Return from "Chinese New Year symbols" to "Foreigners in China" Home Page.